Whitacre: "There's nothing wrong" with GM's culture. DETROIT -- General Motors Co. should attract a new CEO who has “a desire to lead a big company,” said Chairman Ed Whitacre, who is filling in as GM's chief executive until the company can hire someone for the long term. “A person that's a motivating, inspirational leader that's familiar with big companies -- manufacturing or industrial -- would be helpful,” Whitacre told reporters today. 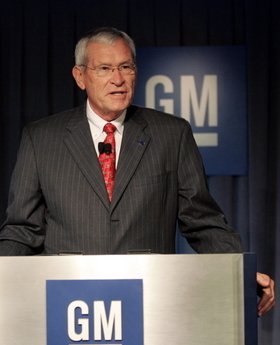 GM's board is looking inside and outside the automaker for a strong leader, Whitacre said. Candidates don't need to be a CEO or even have strong auto credentials. Whitacre, 68, who took over for the ousted Fritz Henderson two weeks ago, said he is not interested in the job long term. He also said he's not sure how long his tenure will last. Whitacre reiterated that compensation restraints placed on GM because of its U.S. government bailout affect the search for the next chief executive. Only two GM employees -- one of them Henderson -- had cash salaries of more than $500,000 after U.S. pay czar Kenneth Feinberg capped GM executive pay in October. The automaker has “ongoing conversations” with Feinberg's office about the new CEO's compensation, Whitacre said. Whitacre is working without pay as CEO; he draws his salary as chairman. The compensation committee of the GM board has to rule on his pay as CEO, and the board doesn't meet until January, Whitacre said. The automaker's pay restraints were partially why Whitacre looked inside GM in making senior management appointments after he took over as CEO.“We can't pay people a whole lot of money here,” he said. He also noted the talent of his current staff. Surrounding himself with car guys is part of the Texan's education as CEO of an auto company. Whitacre spent decades in the telecommunications business before coming out of retirement during GM's bankruptcy this past spring to become chairman. But Whitacre is driving some GM vehicles and telling the company's product development leaders some of what he thinks, he said. The GM board is committed to steering the company for long-term profits, Whitacre said. Whitacre said he's currently living in the Marriott hotel connected to the Renaissance Center, where GM is headquartered. He complained that the Jos. A. Bank store in the building doesn't carry suits tall enough for his 6-foot-4 frame, and he's still learning his way around the mazelike towers of the RenCen. “I've had to stop a couple of times and ask guards or people, ‘Where am I?' ” he said. Whitacre plans to find a condominium or apartment, and his wife is flying in today for her first visit to Detroit since he began working with GM. “I told her to bring her heavy coat,” he said.